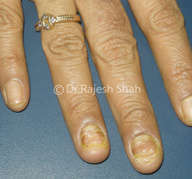 Lichen planus can affect nails in about 10 percent of the cases. 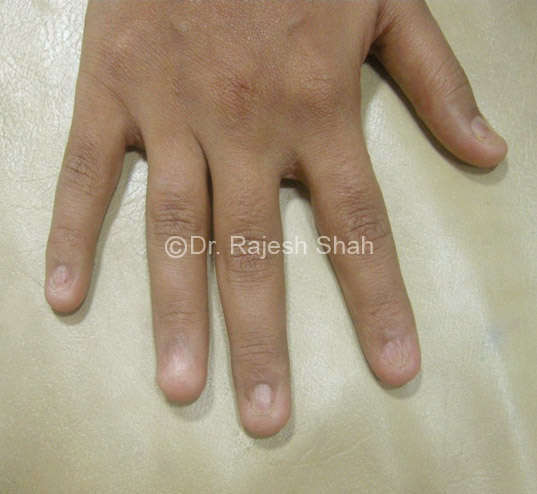 Nail involvement in LP in isolation is uncommon and has always been associated with typical skin lesions. 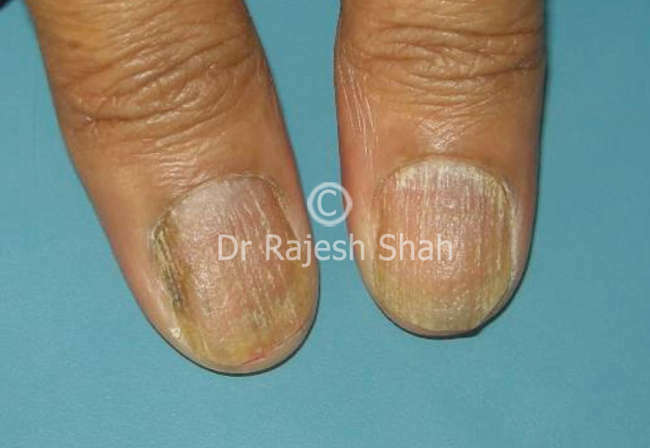 Rarely nail lichen planus may occur in the absence of skin, oral or genital lesions. The majority of nails changes results from damage to the nail matrix or nail root. Nail changes can occur with or without skin involvement. The nails, when affected, tend to become deformed. Commonly only two or three fingernails or toenails are involved. Occasionally all the nails could be affected. 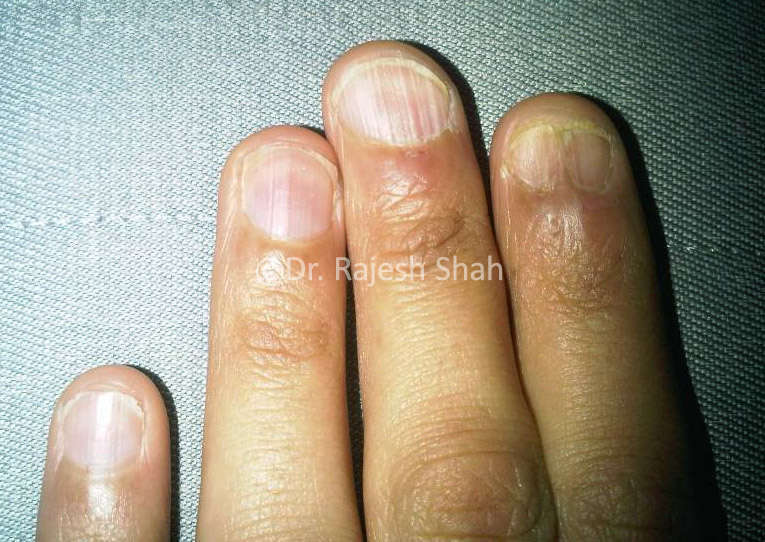 Inflammation of the proximal nail folds which becomes erythematous. 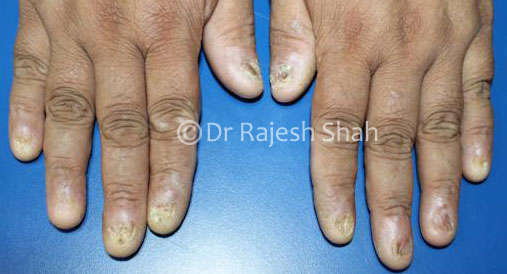 The skin of the fingertips shows a honeycomb appearance due to multiple, small, punctuate and hyperkeratotic depressions. In severe cases, the nail may be temporarily or permanently destroyed. Lichen planus on the nails causes the nails to become extremely brittle and more prone to cracks and splits. To confirm the diagnosis biopsy is required. Associated history of lichen planus on the skin may help to make the diagnosis. Homeopathy medicines are beneficial in the cases of Lichen Planus in the nails. The cracks in the nails heal and the brittleness improves. The discoloration goes away and the nails improve and normalize. (In our experience the Lichen Planus of the skin improves first and the nails improve later.) One can expect excellent improvement with homeopathy. It must be noted that Lichen planus of nails is more difficult to treat than one on the skin.